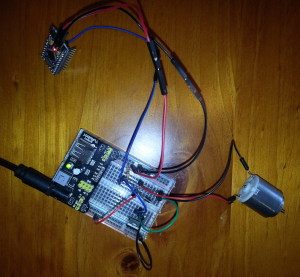 This project is about driving a two speed fan with an Arduino, based on the environment’s temperature. The project has been designed to help automating an existing fire-based heating system. The idea is that the environment will be warmed faster, by driving heated air into the room with a multi speed fan, while the fire is hot and the surrounding environment not yet. I wanted to make it a little more interesting by adding a LCD display to show temperature, humidity and fan status, and four buttons to increase and decrease the two temperature values that drive the fan speeds. When the temperature is below the lowest temperature threshold, the fan will be running at full speed. With temperatures between the lowest and the highest threshold the fan will be running at half speed and with temperatures above the highest threshold the fan will be off. 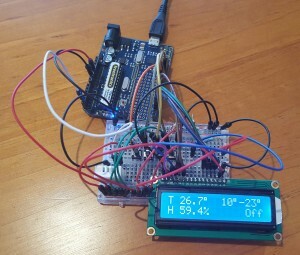 This project demonstrates the use of an Arduino (or compatible) micro controller with a temperature and humidity sensor to drive outputs, it demonstrates the usage of a LCD display, push buttons and EEPROM memory storage. For one of my projects I needed to drive a small motor at different speeds, so I gave this a go by reading and learning more about what is required. 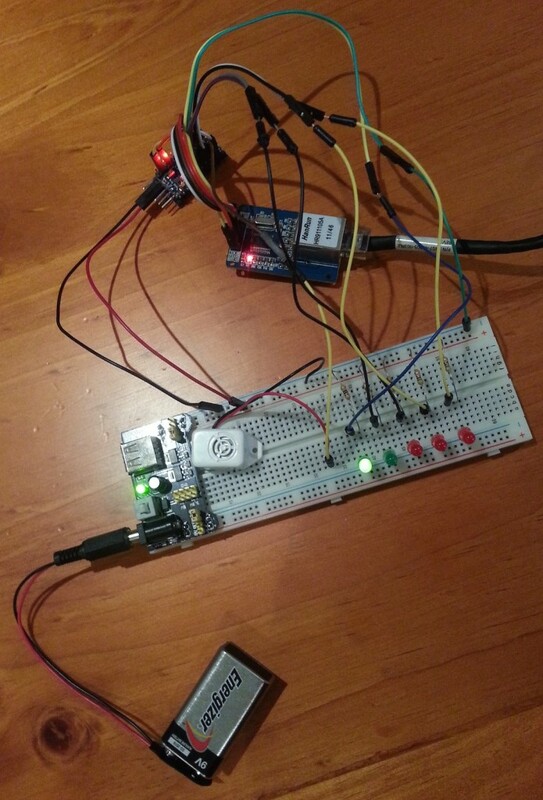 We can achieve that with an Arduino microcontroller by using PWM signals. For this project I am using an Arduino Mini clone, and decided to drive the motor with a N-Channel MOSFET (voltage controlled transistors), activated by a PWM signal. Keeping the frequency of the signal constant, and varying the width of the “on” time vs the width of the “off” time (changing the duty cycle), will make the motor spin at different speeds. The signal values that Arduino expects for the duty cycle is from 0 to 255 and it can be set by using the function analogWrite(pin, value). By providing a different duty cycle value to our Arduino pin (in my case PWM pin number 5), the motor will spin at different speed. 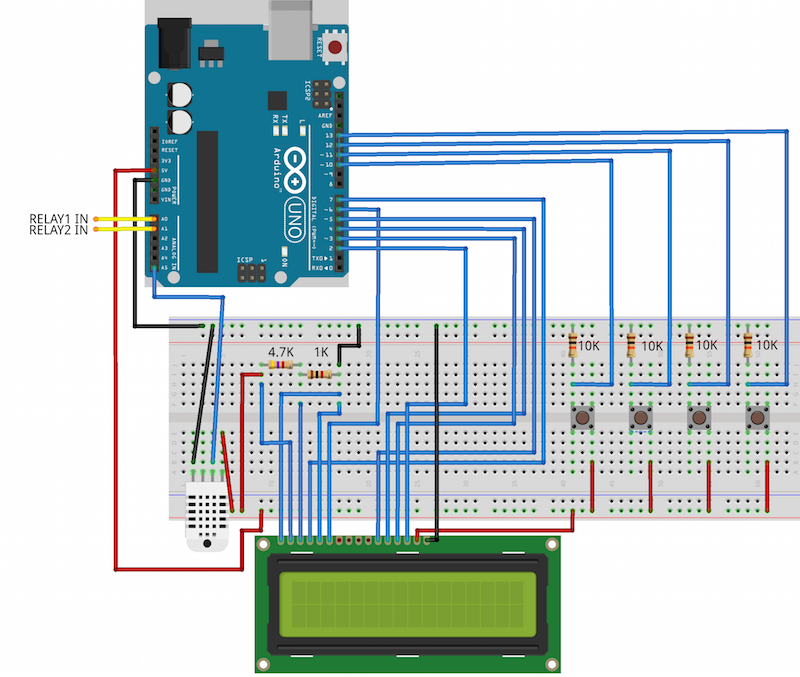 Recently I wanted to start using Arduino embedded micro controllers, to refresh and improve my knowledge of electronics and telecommunications, the subject I studied back in the days at my beloved high school (Arturo Malignani in Udine, Italy). On this post we will see how to connect an Arduino to the internet (and moving towards the “internet of things”) by using cheap components bought in eBay for less than $8! I discovered the fascinating world of hydroponics! A couple of months ago, I was watching random YouTube videos and I found myself discovering what hydroponics is. Since that moment, I was totally in love. I have been growing quite successfully small plants (and some not so small ones, like tomatoes) in my Sydney apartment’s balcony. I was definitely ready for my next challenge! In just few minutes I got into even more “troubles” when I discovered aquaponics… I guess that would be the natural evolution of hydroponics! It was so fascinating watching videos of people building those self-sustaining ecosystems, integrating those with techie stuff… and I had to give it a try! Read moreI discovered the fascinating world of hydroponics! In April I went to San Francisco to attend SugarCON 2012, representing InsightfulCRM. It was actually my first time in the United States! InsightfulCRM is currently part of the SugarCRM Partner Advisory Board, formed by 12 partners worldwide. The aim of the PAB is to communicate to SugarCRM executives feedback and guidance from the partner community (currently there are over 400 SugarCRM partners!). It is awesome for us to be part of the Board!